In response to this important issue, this study was conducted to determine the awareness of medical students from one of the medical college in Pune city, Maharashtra, India. To assess the awareness regarding climate change and its health hazards among the medical students. To recommend the awareness programs/campaigns regarding climate change and its health hazards for students based on results. This study was carried out in one of the medical college situated in Pune city, Maharashtra, India. Medical students from all years of M.B.B.S. (Bachelor of Medicine and Bachelor of Surgery) who had given the written consent were included in this study. Each participant was given a self-administered, pre-tested questionnaire to solve on the spot. The purpose of this study and all the terms used in this study were explained to the respondents and confidentiality was maintained. The data were analyzed by using statistical software Epi Info 2002. Statistical analysis used: Proportions, percentage, Chi-square test. A total of 250 medical students were included in this study, of which 153 were boys and 97 were girls. Of these, 92 were from first year MBBS, 84 from second year MBBS, and 74 from third year MBBS. In all, 246 (98.40%) students commented that global climate is changing, while 245 (98%) students opined that human activities are contributing to climate change. 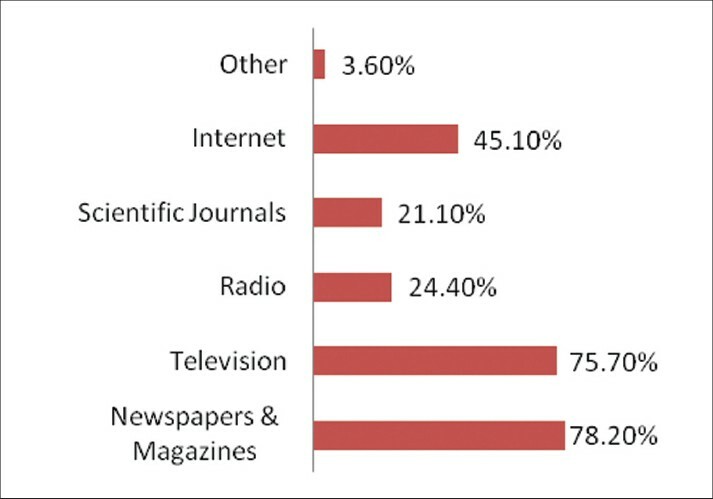 The commonest source of information about climate change was newspaper and magazines (78.20%), followed by television (75.70%), Internet (45.10%), radio (24.4%), and scientific journal (21.1%) [Figure 1]. In all, 75 (30%) of the students heard about United Nations Federation on Climate Change (UNFCC) and Kyoto protocol and 85 (34%) heard about IPCC. In all, 77.10% of the students commented that deforestation contributes most significantly toward climate change, 62% commented that industrial pollution contributes to climate change, followed by vehicular pollution (56.2%), coal burning for energy (28.4%), and pollution during festival (20%). According to 47.50% of the students, health-related issues are priority for climate change prevention strategy action plan followed by transport issues (25.60%), agriculture and fishery issues (19.6%), and energy issues (0.4%). Of the health hazards, according to 65.10% of students, direct physical hazards of extreme climatic events are most important health-related impact of climate change, followed by natural disaster-related health hazards (43.50%), waterborne diseases (27.60%), vector-borne diseases (17.60%), and malnutrition (10%). According to 56 (22.4%) students, the health-related impact of climate change is the same in all the places, while 194 (77.6%) did not agree with the same [Figure 2]. According to 88.5% of the students, education and awareness are the most effective strategies in tackling climate change followed by lifestyle changes (63.3%), international partnership (22.4%), and more research in climate change (18.4%) [Table 1]. There was statistically significant difference found between year of MBBS of the students and the awareness regarding UNFCC and Kyoto protocol (χ2 = 7.85, P = 0.02). First year MBBS students had more awareness followed by third year MBBS students, while second year MBBS students had least awareness. There was statistically significant difference found between year of MBBS of the students and the awareness regarding IPCC (χ2 = 12.77, P = 0.002). Third year MBBS students had more awareness followed by first year MBBS students, while second year MBBS students had least awareness. The significant difference was also found between the awareness about health impact of climate change at different places (χ2 = 17.29, P = 0.001). Third year MBBS students had more awareness followed by first year MBBS students, while second year MBBS students had least awareness [Table 2]. 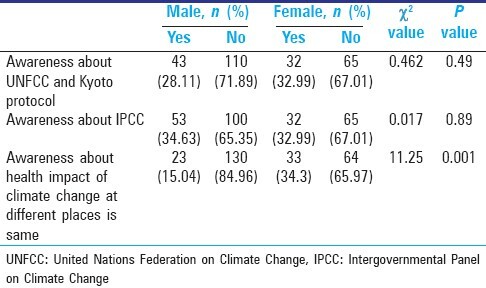 There was no significant association found between the gender of the students and awareness regarding, Kyoto protocol (χ2 = 0.462, P = 0.49), and IPCC (χ2 = 0.017, P = 0.89). There was significant difference found between the awareness about health impact of climate change at different places (χ2 = 11.25, P = 0.001). Females had more awareness compared with males. A total of 250 medical students were included in this study (153 boys and 97 girls). In all, 246 (98.40%) students commented that global climate is changing, while 245 (98%) students opined that human activities are contributing to climate change. Similar findings were reported by Majra and Acharya in their study, which was conducted among the medical interns where majority of the respondents (113, 87%) were aware that there is a climate change. In a study conducted by Pandve et al.,  98.5% of the respondents said global climate is changing; 95.5% of the respondents also commented that human activities contribute to climate change. In this study, the commonest source of information about climate change was newspaper and magazines (78.20%), followed by television (75.70%), Internet (45.10%), radio (24.4%), and scientific journal (21.1%). In this study, 77.10% of the students commented that deforestation contributes most significantly toward climate change, and 62% commented that industrial pollution contributes to climate change, followed by vehicular pollution (56.2%), coal burning for energy (28.4%), and pollution during festival (20%). In the study by Majra and Acharya, majority of the respondents were aware of the various human activities, such as the ever increasing population (85%), industrialization (88%), urbanization (92%), deforestation (92%), increase in international trade or travel (85%), and our increasing dependence on carbon-based energy, such as fossil fuels (88%), which contribute to the climate change. In this study, 30% of the students heard about UNFCC and Kyoto protocol, while 34% heard about IPCC. In the study by Pandve et al.,  only 45.3% of the respondents knew about the UNFCC and Kyoto protocol, while 45.8% were aware of the IPCC which conducts scientific analysis of climate change, global warming, and its hazards. 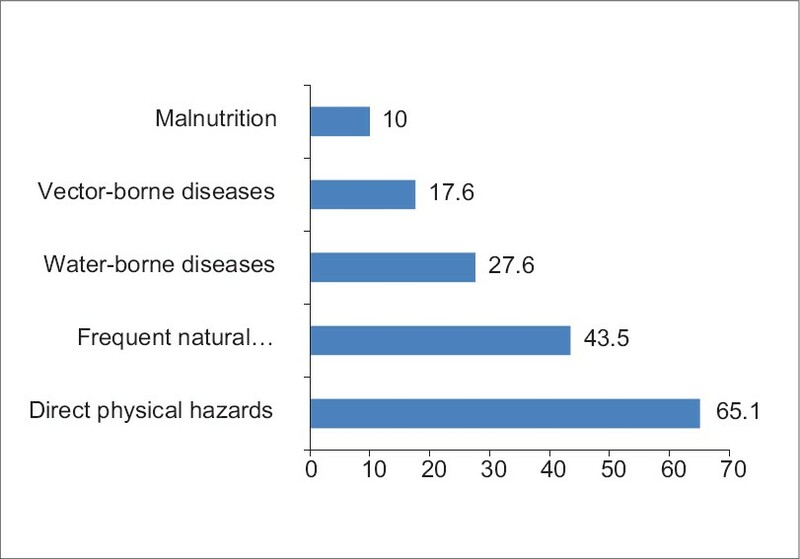 In this study, according to 65.10% of the students, direct physical hazards of extreme climatic events are most important health-related impact of climate change, followed by natural disaster-related health hazards (43.50%), waterborne diseases (27.60%), vector-borne diseases (17.60%), and malnutrition (10%); 77.60% of the students reported that health-related events are not the same in all the places. In the study by Majra and Acharya, most of the respondents (122, 94%) were aware of the direct health hazards. However, about three-fourth of the respondents were aware of the more important health hazards, such as the change in frequency or distribution of vector-borne diseases, waterborne-related diseases, malnutrition, and health impact of population displacement, due to floods (coastal and inland), droughts, and so on. In this study, education and awareness regarding climate change are the most effective strategies in tackling climate change issues according to 88.5% of the students, followed by lifestyle changes (63.20%), international partnership (22.2%), and more research in climate change (18.4%). In the study conducted by Majra and Acharya, knowledge of the medical interns regarding health protection was limited to mitigation of climate change by means of decreasing the use and dependency on fossil fuels, more use of renewable sources of energy, decreasing air pollution, reforestation, training of the healthcare provider, and education of the masses. In the study by Pandve et al.,  about 54.5% of the respondents believed that youth could play a major role in combating climate change. In this study, majority of the students commented that global climate is changing and human activities are responsible for it. The awareness regarding important agencies and protocol in the field of climate change was found to be poor. Students had awareness regarding health hazards of the climate change, but improvement for mitigation is required. It is suggested that a large nation-wide awareness survey regarding climate change and its health hazards is necessary to determine the preparedness of medical students and also to suggest any changes in the current curriculum. The students represent only one medical college; this may have induced some bias in the study sample. This study was supported by the Indian Council of Medical Research Short Term Studentship Program 2010 (ICMR-STS 2010). The authors would like to thank Dr. A.V. Bhore, Dean, Smt. Kashibai, Navale Medical College, Narhe, Pune; Dr. (Air Cmde) Kevin Fernandez, Prof. & HOD, Department of Community Medicine; and Dr. (Col) P.S. Chawla, Deputy Dean & Professor, Department of Community Medicine, Smt. Kashibai Navale Medical College, Narhe, Pune. 2. Nichols A, Maynard V, Goodman B, Richardson J. Health, climate change and sustainability: A systematic review and thematic analysis of the literature. Environ Health Insights 2009;3:63-88. 3. Boxall AB, Hardy A, Beulke S, Boucard T, Burgin L, Falloon PD, et al. Hazards of climate change on indirect human exposure to pathogens and chemicals from agriculture. Environ Health Perspect 2009;117:508-14. 4. Majra JP, Acharya D. Protecting health from climate change: Preparedness of medical interns. Indian J Community Med 2009;34:317-20.